2009 aasta alguses meie turundus – tootmise ühing «ReFurbished Service» sai sertifikaadi esindusloaga Balti riikides – Läti, Leedu ja Eesti, tootele UNITY. UNITY bränd toodab mitte ainult tarbeesemeid trükkimismasinatele – laser ja tindi toonerid, vaid ka MP4plejerid, plasma HDTV, multimeedia akustika, aksessuaarid ja kõrvaklappe. 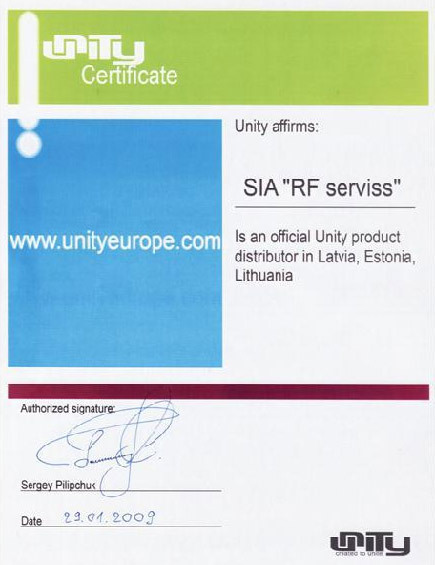 Rohkem informatsiooni saate näha leheküljel www.unity.lv. Most parts in UNITY™ cartridge manufacturing are supplied by such leading companies like : Mitsubishi Chemical FP America Inc. , AEG Elektrofotografie GmbH, HANP and OCP Ink GmbH Germany. Only 100% new parts are used in cartridge manufacturing! UNITY™ cartridges are being tested after manufacturing and after shipment! UNITY™ cartridges are made and tested under ISO/IEC 19752:2004 & CE standards on manufacturing facility certified with ISO 9001:2000 and ISO 14001:1996. Perfect quality, returns 1 of 1000 only! ISO 90001:2000 and 140001:1996 certificated manufacturing facility. All cartridges are 100% pre-tested. High volume of ink, comparing with OEM cartridges. Filled with High-quality ink from German manufacturer. Wide spectrum of available models for all popular trademarks. Attractive color packing with high cartridge safety level. A list of compatible printer models included. Included installing instruction for Latvian, English, Russian, Lithuanian, Estonian languages. Fast release of new cartridge models for the new printers.